New page under construction: watch out for holes and scaffolding. In case the little bits of information here make you want to know more, I'll put links to some "further reading" at the end! People are often surprised to discover that there were once glaciers in Scilly, but it is true! During the last ice age, the ice sheet that covered most of the British Isles reached an arm down through what is now the Celtic Sea and for a while part of the southern edge of the British-Irish Ice Sheet lay across the northern edge of what are now the Isles of Scilly. I say "what are now" the Isles of Scilly because during the ice age global sea level was much, much lower than today, so the glacier that advanced towards Scilly from the north was probably advancing over dry land, and Scilly was just a slightly higher area of ground. Can we see any evidence in the landscape? Yes, there is evidence to be seen in the landscape if you know what you are looking for. The "glacial landscapes" of Scilly are not like the famous U-shaped valleys, drumlins or pyramid peaks that your GCSE textbook will tell you to look for in places like the Lake District. The ice only just touched up against Scilly, and left only a slight trace. The clearest evidence is in the debris that the glacier scraped up into its bed as it slid down from the north, which it dumped on the northern slopes of the Scilly uplands. Glaciers are a bit like conveyor belts in that they pick up debris (rock, mud and anything else they travel across) and transport it forwards through the ice. Sometimes the debris gets smeared down again under the ice further forward in the glacier, and sometimes it travels all the way to the front and gets dropped out at the margin. This deposited debris (which is often called "glacial till") is made up of rock types from wherever the ice picked up the debris. If bits of rock get moved from the geological area where they originated and are deposited in a different geological area they can easily be identified as being out of place. These are called "erratic" rocks. Scilly is made pretty much completely of granite, but the ice travelled here across a whole range of different rock types on its way south. Where bits of those rocks from the north show up in the deposits on Scilly as erratics, clearly not derived from the local granite, they are good evidence that we can use to work out the exact route followed by the ice. These erratics also sometimes have distinctive scratches and scapes on them, caused by their being dragged along under the ice. What do these glacial rocks in Scilly look like? It is easiest to say what the glacial rocks in Scilly don't look like. The rocks that might have come from the glacier are the ones that don't look as though they have anything to do with the local granite. The local granite itself has a bit of variety in it, and contains mineral veins reflecting a complex geological history, but Scilly does not have in its bedrock anything like sandstone, or limestone, or basalt or flint, for example. 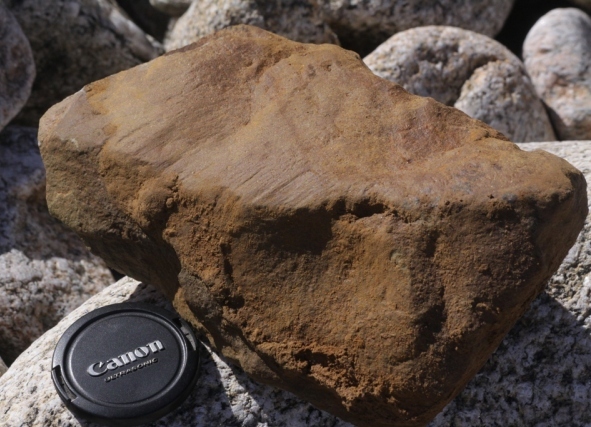 If you are looking for glacially-transported pebbles you want to look for things like that, which don't belong. One of the earliest records of these glacial erratics was a description of bits of chalk, flint and greensand found on Castle Downs, Tresco. Now, you might say "what if some mischievous tourist brought a pebble from Yorkshire and left it lying around, wouldn't that confuse things?". Indeed it would, as would stone imported for building. So really we shouldn't just be looking at pebbles that are lying around willy nilly on the beach or in the fields. We want to look for pebbles that are still firmly embedded in the deposits laid down by the glacier. In fact, these are pretty rare, so really I shouldn't be encouraging you to go digging about and taking the few rare pebbles that might be left. Geologists can be a vandalous bunch. Perhaps, like our rare flowers, we should enjoy our rare glacial sediments without destroying them! Having said that, a big northerly storm will take bites out of the cliffs, so you might find something just conveniently dropped out for you! Here are a some pictures of a couple of erratics that I found on the north coast of St Martins. This first one (above) is a chunk of basalt (I think) with some very clear glacial striations (scratches) on it. Also, in the background, I just noticed what looks like a bit of flint - another glacial erratic that you can find in these tills! 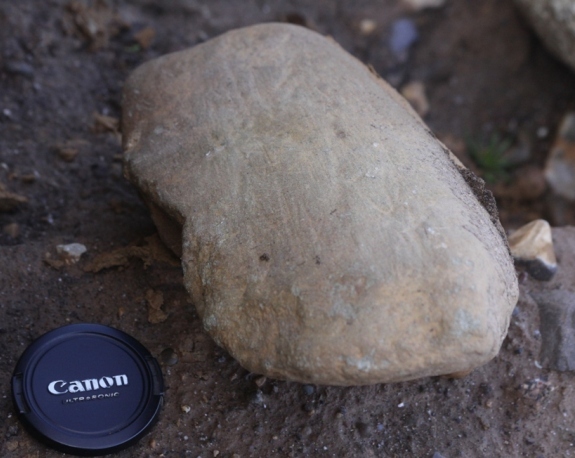 This second one shows the striations very clearly on one face of the rock. It is quite common for just one part of a rock to pick up these scratches as it moves around under the glacier. Where exactly will I find these glacial sediements in Scilly? If you know Scilly at all, you will be familiar with the gravelly orange cliffs of "ram" or "head" that overlie the bedrock all around the islands' coasts. This is NOT glacial sediment, so don't get excited. Actually it is still quite exciting, as it is what we call a "periglacial" deposit, created by mass movements (soil creep and landslides) when the ground was going through periods of thawing and freezing during the ice age when glaciers were nearby but not actually covering the islands. The glaciers only seem to have covered a tiny little bit of the north of Scilly, and that is where you can find the glacial sediments: the "till" that contains the erratics. The glacial sediment generally has more clay and silt in it compared with the dominantly sandy gravel of the ram or head around the rest of the islands, but both the till and the ram have lots of stones and boulders in, so it is not always easy at all to tell the difference! In section of cliff on St Martins, there is a layer of till sandwiched between layers of ram above and below it. What geologists call the "type site" for the Scilly till, in other words the location where they had a good look at it and were able to describe and define it properly, is Bread & Cheese Cove on the north east side of St Martins. In fact, this location features in a guide to the UK's most important Geological Sites relating to the history of the last 2 million years or so that was published in 2015 (see reading list below). Over the years a number of professional (and amateur) glacial geologists have explored the northern coastlines of Scilly looking for glacial deposits, and it seems that you might strike lucky anywhere along that thin strip of coastline across the northern perimeter of Scilly from the eastern end of St Martins around to the northern coasts of Tresco and possibly even Bryher. It has been suggested that the White Island bar might have been pushed up as a ridge of rocks by the bulldozer effect of the front of the glacier, and I think (although I have not seen this published anywhere) that the ridge, a few metres high and a few hundred metres long, that runs parallel to the coast around the north west corner of St Martins overlooking White Island looks very much like a glacial moraine (a ridge of debris deposited or pushed up by the ice). There are is also a layer of gravels on Tresco (called the Tregarthens gravels!) that are supposed to have been deposited in streams running off the glacier, and there is a line of boulders at Shipman Head on Bryher that is supposed to be a glacial moraine: a ridge of debris pushup up by the edhge of teh ice. Some people have argued that the top of Round Island shows signs of glacial erosion, indicating that the glacier actually ran over the top of it. Have any real geologists done any work on these sediments? Indeed, a number of real geologists have done a lot of work on the glacial history of Scilly, and it has become quite topical recently because it turns out that understanding how the ice managed to get so far south might give us answers to some big questions about how the British Ice Sheet actually worked! Amongst others, James Scourse has worked on these deposits for many years, and he is the most eminent expert on all this material. Recently a project known as "BRITICE", looking at the history of the ice sheet, has included a lot of work on glacial sediments in the Celtic sea and on Scilly. There are references to some of that work at the end of this page if you want to chase it up. As early as the 1850s, geologists wrote about erratics found on Tresco, and in the early 1900s there was a paper about striated boulders found on St Martins. Why have you put this information here? Well, it might be useful or interesting to somebody! There is a lot of published work on this, but a lot of it is hard for the public to access, I was motivated to post this after a twitter conversation with @ScillySergeant He showed a picture of St Martins and said something about snow, I said something about glaciers, he asked something about pebbles, I couldn't fit my answer into 140 characters or fewer, so here we are. I am not the world expert on this - or any kind of expert, much at all, in fact. So if you want to check up the details of this, or read a bit more, I'll post some "further reading" below. And for something a bit more locally-based and user-friendly I should add that whenever I have approached the Isles of Scilly Museum, I always seem to find out something new and interesting. I have not checked, but perhaps they might have some information. Perhaps they could put on a nice display of erratic pebbles!